When not to use APEX? When I did some talks last year, I got the question "When would you NOT use Oracle Application Express (APEX)?". I created a draft message in my blog posts as I found it interesting getting this question. I never posted it, but now I decided to post something about it. I find it a difficult question for a person who's passionate about a technology! So what do I normally answer? Most of the time they insist to give more answers. It can't be true that you can use APEX for everything! To be honest, I don't think APEX is a good fit in every situation, but to name these situations that's something else. Or ... What would you answer? I got some questions about setting the default value of a shuttle. The example can be seen here. Basically a Shuttle are two lists: on the left you'll see all values, which you can select by moving it to the right. If you already want some values on the right when you open the page, how do you do that? 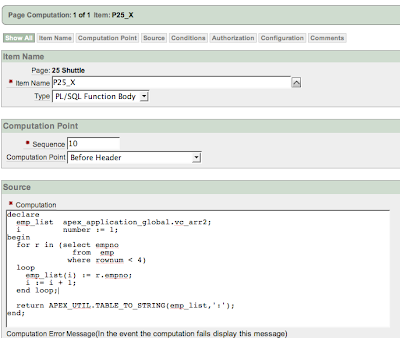 The APEX components in my example: a Region, a Shuttle item and a Computation. It fills an array "emp_list" with all the values you want to have already selected (on the left in the shuttle). In my case the first 3 records. The most important part is the last line APEX_UTL.TABLE_TO_STRING. Which transforms the array in a way so the shuttle can understand it. A string, with in between the values a ':'. That's just one way of doing it. In APEX you can follow different ways to accomplish the same result. Hope it helps some of you. Just as last year I'll be speaking on some major Oracle events. I'm also talking at some smaller events (mostly one day seminars) in the BeNeLux, but the dates are not fixed yet. PS: I always like to put a picture in my blog post, but I didn't want to add an obvious one this time. Finally I decided to go for Smeagal (Lord of the Rings), somebody an idea why? After the first round in Europe, there will be a second round in the States! On the last day of ODTUG Kaleidoscope 2008 we'll have a new "fight"... This time my opponent is not Lucas Jellema, but Peter Ebell. Peter is also a big name in the Java world. He was one of the key persons in the JHeadstart team and he has a broad knowledge about Java, BPEL and SOA. As a side note, did you see Oracle acquired BEA? I'm happy I'm concentrating on the Oracle database and APEX is living in that. It doesn't change that much. The (Oracle) Java world is moving so quickly! I wonder if Peter will talk about deploying ADF to BEA Weblogic. But I suppose these days are exciting moments for the Oracle Java people. This post is part of the series of blog posts about "My Top 15 Oracle Database 11g New Features for APEX Developers". Already published articles: 15-Virtual Columns. Why would you like to use this feature? 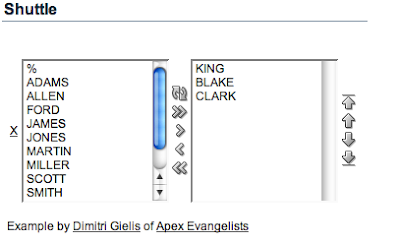 For some people APEX is a first touch in the Oracle world. People who just start to develop applications may not be that experienced in Oracle yet. They start creating schema's, tables, indexes etc. through the wizard or by copy/pasting from things they have seen. Unless they've a senior person looking at their code or they hire an external company to get them to the next level, it's not that easy to get recommendations. You can read lots of books or search on the internet, or you could use some features of the Oracle database to help you. Oracle 11g provides a lot of "Advisors", one of them is the SQL Access Advisor. Maybe you have used SQL Tuning Advisor before? That's nice to tune individual SQL statements, but SQL Access Advisor is even nicer as it looks at a lot more to give you the "right" advice. 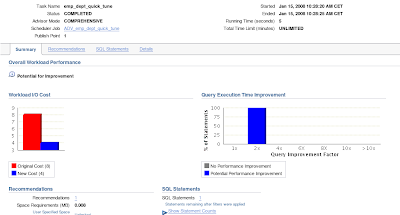 SQL Access Advisor evaluates an entire workload of SQL and recommend indexes, partitioning, materialized views that will improve the collective performance of the SQL workload. In other words, where SQL Tuning Advisor looks at one statement, SQL Access Advisor looks at the complete picture. It may be possible that the SQL Tuning Advisor recommends creating an index, but SQL Access Advisor would recommend to not create the index, but to create a materialized view or partition as it looked at the entire workload, including considering the cost of creating and maintaining the index. You would need to create a plsql script which calls the dbms_advisor package or use Enterprise Manager to guide you through the steps of defining the workload and creating for ex. SQL Tuning Sets. More information can be found here. I would encourage you to use Enterprise Manager to access SQL Access Advisor. The wizards will guide you to all the necessary steps. The SQL Access Advisor is located in the Advisor Central - SQL Advisors section of EM. As I already configured a Quick Tune for my SELECT statement through dbms_advisor, it's listed in the screen of Enterprise Manager. When you click on the outcome of SQL Advisor Quick Tune, you get a nice graph with what the initial cost was for the select statement and what it could be like if you would implement the recommendation. Especially the above screen makes it worth to use Enterprise Manager to tune your schema. In my example I only used the SQL Access Advisor to tune one statement (I could also have done it with the SQL Tuning Advisor), but tuning your entire schema isn't that different. You would specify the workload (even an hypothetical workload), the advisor would look at all that information and would give you of course more information as I had with one statement, but the principle is the same. There's another nice example of using SQL Access Advisor written by Arup Nanda here. 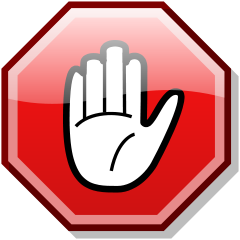 Having SQL Access Advisor available doesn't mean a good database design isn't important anymore! I would recommend taking time to get the design right from the start. As the database gets more and more complex, and you're having more and more data, it's nice to have a feature like SQL Access Advisor which can help you to look at the performance. I thought it a good idea to write a series of blog posts about some new features of the Oracle 11g database I find useful in an APEX project. and Tom Kyte's Top 11 things about 11g. If you've an orders table with the unit price and the quantity, wouldn't it be useful to have the total (= unit price * quantity)? Or when a store has a price list of items they buy, they add 30% to it to get the price they sell the item too. Or getting the initials of a name. Or seeing the date in a specific format. Or... Having that kind of information already in the table may be of help. If we query the new EMP with Virtual Column table, we'll see all data of the normal EMP table + the new virtual columns (red): the new salary (10% higher), the total package of the salary and commission and the hire year. I wanted to put the examples online on the new APEX 3.1 instance, but it doesn't seem to run on 11g... (as my creation of my table failed). But as you see on the screenshot, it's running on my local machines. If you look at the user_tab_columns view you'll notice a column called data_default, which contains the expression of the virtual column. 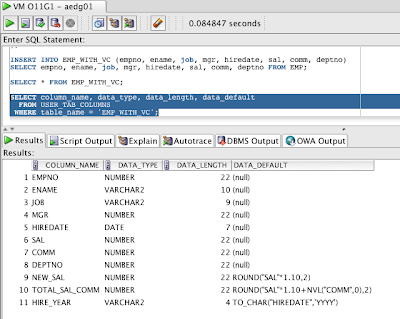 You can partition on Virtual Columns ! The full documentation about Virtual Columns can be found here. The last couple of hours I got some mails, asking for help. But when I replied I got an "Undelivered Mail Returned to Sender". I'm not sure if they made a mistake or did it deliberate, that's why I blog about it as I can't reach "you". But without wanting to offend anybody, I guess it was an early first April joke? I wish project work for you, urgent dimitri needs fast will pay on project. call now. I have a 1,000,000 Euro project and would be interested in talking to you about it. So if you're serious please provide the right email address so I can contact you properly. I remember the early days where we got some chain letters. You got luck when you would sent that letter to 10 others. I guess the guys started this, did a lot of these things before? They used the same principle but an up-to-date technology. I got "tagged" by the great Tim's: Tim Hall and Tim Dexter... so I'm "it". I was a fan of Manchester United, especially when Eric Cantona and David Beckham were still there. I even went to the stadium and walked on the field and saw the dressing rooms. As a little kid (around 1983) I played Super Bunny on my fathers Apple II. At that time you had only floppies, but we had already a paddle (sort of joystick)! 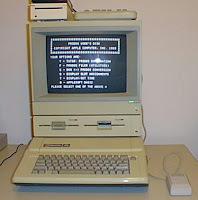 When I was 10 years old, I bought my first PC (an IBM XT), from that moment all my money went into buying pc stuff. I had only one "real" girl friend and she became my wife. As a little kid I wanted to become a "Bank Director". When I had to fill in the "poezie album" of somebody, most of them filled in with "Favorite food"; French fries, but I was the only one who filled in; "Chicory with ham and cheese covered with breadcrumbs". 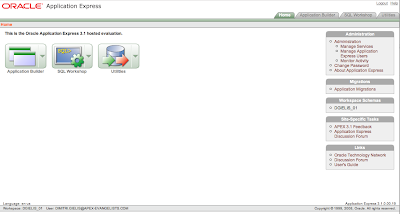 I just logged in into the online Oracle Application Express 3.1 hosted evaluation version. I was surprised it got upgraded. The message says it got updated on January 7th 2008, so only a couple of minutes ago (as in Belgium we're a bit ahead of time). The icons look more slick I think. The current version is 3.1.0.00.19. I'm still figuring out what has changed. I guess the APEX-team will tell us in a moment. It's always nice to see updates coming out. Thanks APEX Development Team and keep up the good work. First, thank you for all your comments about our public evaluation instance of Application Express 3.1. We wanted to let you know that we just completed an upgrade of the instance to bring it up to date with our development. Many of the issues with Interactive Reports should be fixed now and you will also be able to see and use other new features such as the new Workspace Themes. If you find any new issues, please report them using the feedback application. The link is also available from within the hosted Application Express 3.1 evaluation instance Home page. Some people published the feedback they received from their presentation at the UKOUG. I read first Marco Gralike's post how he felt with his scores. It's always interesting to see how the audience react to your presentation. You learn a lot from the evaluations afterwards. Worst would be you thought you did a great job and afterwards you find out people didn't like it. You can always learn something to make the presentation better! To come back to John's presentation, that was indeed a really good one. Especially the debugging of APEX applications through SQL Developer I found impressive. Immediately after the session a lot of people congratulated him, then you know you did a great job. Congratulations John! I guess you must be close to the "best speaker" award! If you want to see him presenting soon... London, March, at the European APEX Training Days. I hope you all had a nice Old on New. This year I held it quite quiet. I played some (board-)games with family and had some nice food. I like playing games like Pentagon, The Settlers of Catan, Highscore, Ave Caesar, Poker etc. 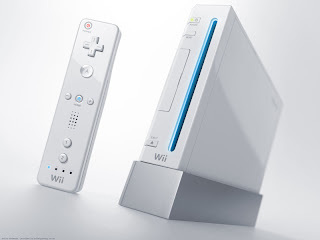 I especially like the Wii when you can play against others. Do some boxing or playing a game of baseball against your family is so much fun! As you read this blog, there's a great chance that you're behind your pc for more than 10 hours a day... maybe the above can help you? It did help me to "relax" during my holidays.